Washington - U.S. Secretary of State Mike Pompeo on Monday condemned the rise of anti-Semitism as a “cancer metastasizing” in the Middle East, Europe and in the United States, where he said the Trump administration would vigorously oppose it. 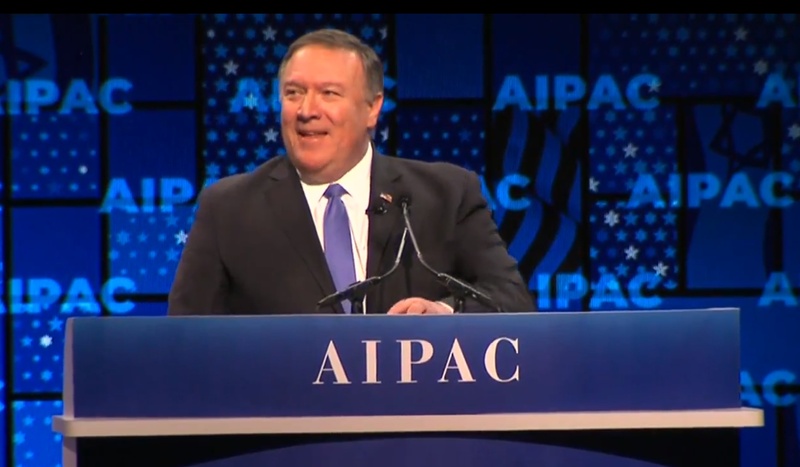 In a speech to a major pro-Israel U.S. lobby group in Washington, Pompeo accused Britain’s opposition Labour Party of tolerating anti-Semitism, calling it a “national disgrace”. Earlier on Monday, U.S. President Donald Trump recognized Israel’s 1981 annexation of the Golan Heights in a boost for Prime Minister Bejamin Netanyahu, who faces an election on April 9. In Britain, Labour has been battling accusations of anti-Semitism for over two years. Nine lawmakers have quit the party, citing the leadership’s handling of anti-Semitism in the ranks as well as its Brexit stance as their reason for leaving. I highly appreciate people, like Trump and Pompeo, who are not afraid to tell the truth. Many in America do not dare say that the Jewish people have a historical right to their land, the Land of Israel, even though they think so too. They are afraid that they will be called racists, as if to lie and say that the Land of Israel belongs to the Arab invaders is not racism for itself. The Arabs have enough territories they occupied in the 1300 years of Islam, annexed and Islamized ancient peoples. This does not make them the owners of the places they have conquered, such as Spain is not Islamic land as many of Muslims still claim. This is the time to tell the truth - the Land of Israel, Palestine in the name of its many conquerors along last 2000 years of history, is the land of the people of Israel. too bad capo Chuck cant condemn anti Semitism in his own home borough of Brooklyn while Pompeo a non jew from Kansas can.